A lot of my favorite paintings hang in London's National Gallery. I've been very blessed in my life to have visited the museum several times and each time I discover something new that takes my breath away. 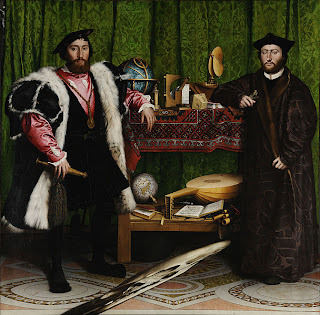 On my first visit, my son Alex and I walked past the painting, entitled, The Ambassadors (1533) by Hans Holbein the Younger (1497-1543). At first glance, it looks like a simple double portrait of some fancy-dressed guys. But when you look closer one sees a distorted skull in the foreground. The painting simply stopped us in our tracks. We were in awe, especially when we moved to the right and viewed a full version of the skull. 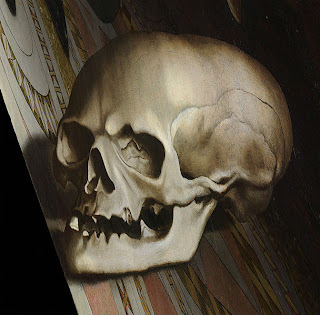 Besides the skull, this painting is riddled with all sorts of interesting objects. In fact, it held the attention of my son for a good half hour and he was only 11 at the time. 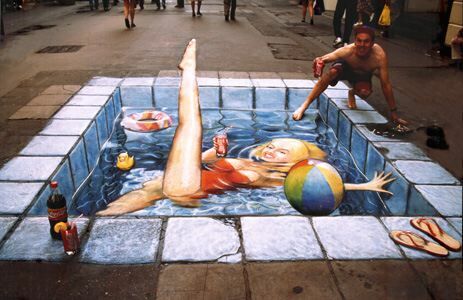 This picture is a prime example of how art can touch you. 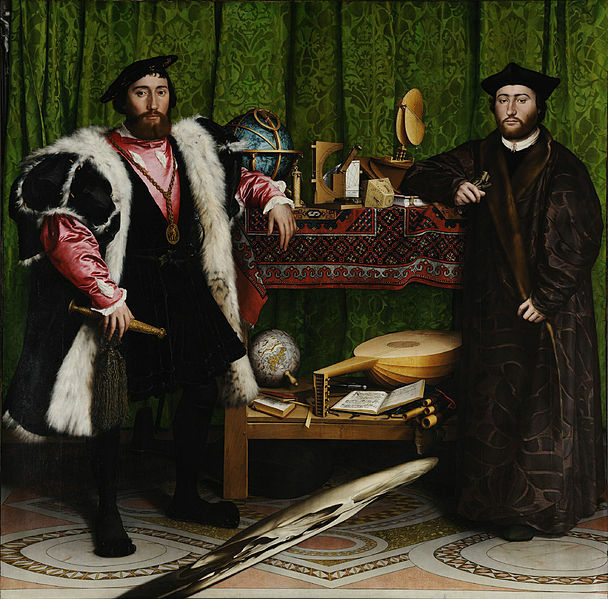 The figures are two wealthy and powerful young men: Jean de Dinteville (29), French ambassador to England and to his right, stands Georges de Selve (25) bishop of Lavaur, some-time ambassador to the Holy See. Both are educated, as is demonstrated by the literature, music and globe. Along with the skull, all these symbolic objects have caused great discussion throughout the years. The skull viewed from the right. Above you can see the distorted skull in full view when standing to the right of the painting. This distortion is called anamorphic perspective. Today we see this type of rendering with street artists, who create depth-like chalk paintings in sidewalks. Next month, I'll cover another painting at the National Gallery, which tops my list for my all-time favorite: The Execution of Lady Jane Grey (1833), by Paul Delaroche. Until then, I hope the sun comes out soon and brightens your life!